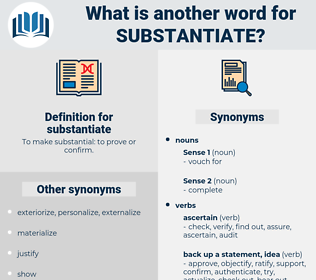 What is another word for substantiate? To make substantial: to prove or confirm. showing once and for all. 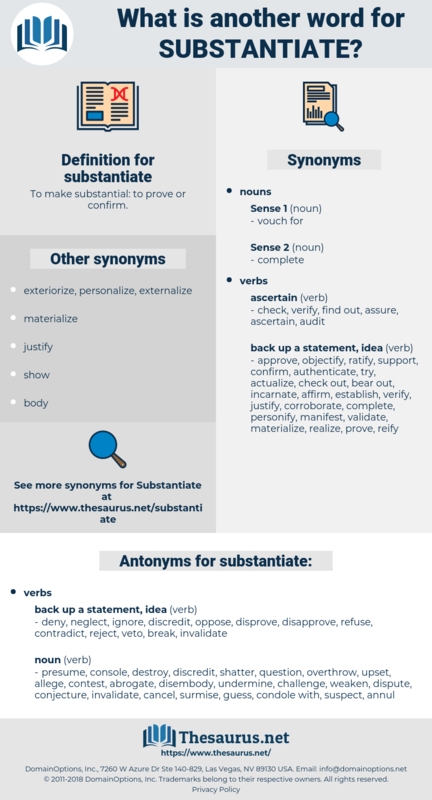 ground, justify, Justifying, lay, validate, confirm, confirmed, support, supported, supporting, demonstrate, demonstrating, prove, verify, underpin, sustain, motivate, illustrate, buttress, establish, Establishing, explain, ascertain, certify, vindicate, inform, testify, bolster, show, endorse, consolidate, affirm, replenish, check, justification, base, enrich, cross-check, legitimize, document, strengthen, proof, rationalize, uphold, assert, backstop, accredit, defend, determine, build, supplement, complement, reconfirm, amplify, excuse, indicate, basis, augment. corroborate, warrant, reinforce, evidence, test. deny, neglect, ignore, discredit, oppose, disprove, disapprove, refuse, contradict, reject, veto, break, invalidate. challenge, allege, conjecture, undercut, surmise, annul, overthrow, suspect, shake, contest, guess, question, dispute, console, undermine, weaken, condole with, disembody, cancel, object, unsettle, upset, abrogate, presume, destroy, shatter. I hope within a very short time, to - morrow or the next court - day, to finish it, and to go directly into evidence, as I long much to do, to substantiate the charge; but it was necessary that the evidence should be explained. Mr. Jabavu had not met any member of Parliament and discussed the measure with him or with a responsible Government official; so he found it awkward to accept a challenge to substantiate his arguments, in the presence of one who had not only discussed the measure with members of Parliament, with Cabinet Ministers and their representatives, but who had also witnessed the ravages of the Act amongst the Natives in the country.